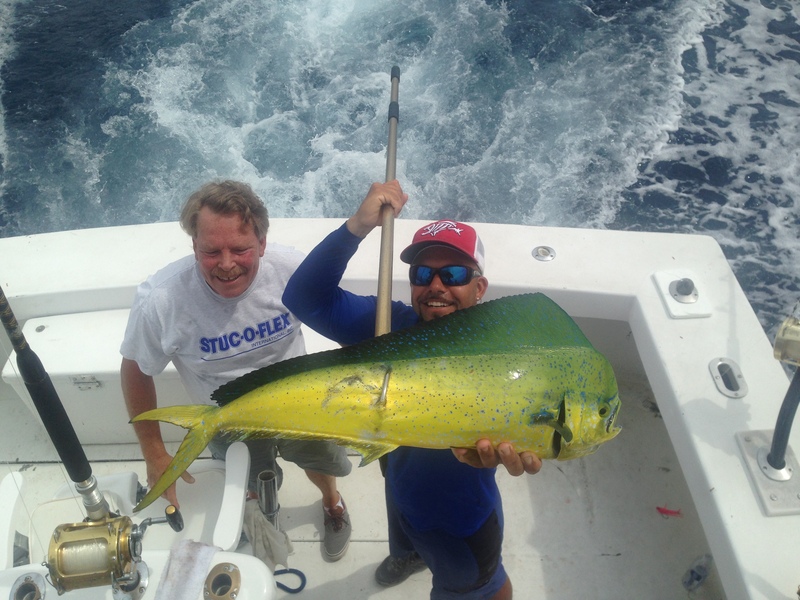 Dolphin are biting good on our sportfishing charters this week out of Ft Lauderdale. The weather has been very windy this week. It’s kept a lot of the small boats home and even some of the big boats. We’ve been fishing every day though and let me tell you, the fishing (and the catching) has been great! 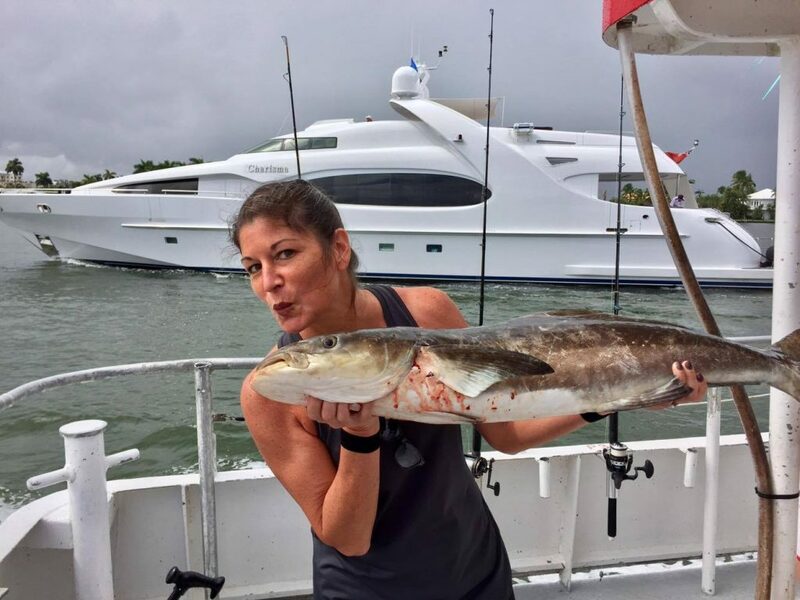 Dolphin, tuna, sailfish and more are biting. The reason? the strong easterly wind. A hard east wind gets the fish chewing. It blows the seaweed and debris in closer to the shore and with it, the dolphin. If you can handle the waves, these are the conditions we wait for all year for the really good fishing. It also helps that many boats haven’t been fishing the past few days, making less competition for the fish. Nice sailfish just caught fishing the Ft Lauderdale reef. Dolphin aren’t the only fish that’s on the menu. 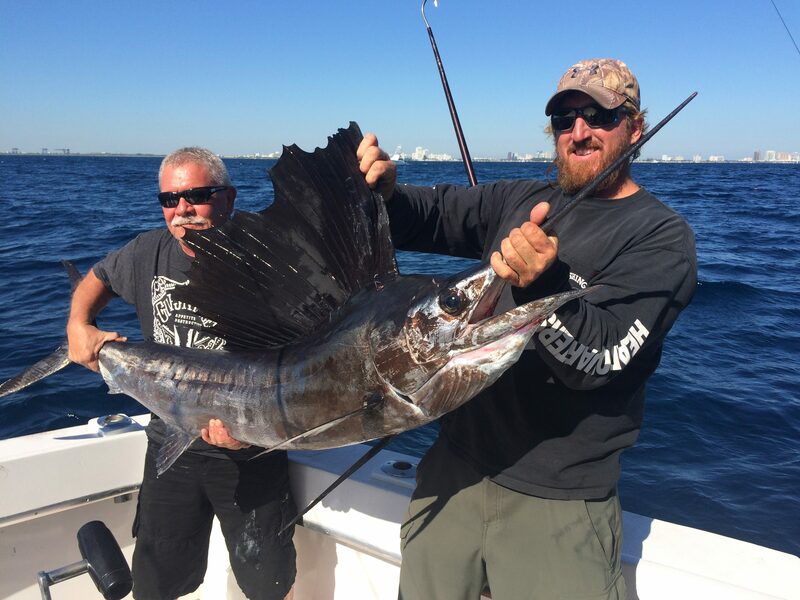 Sailfish, our most sought after gamefish, are biting with a voracious appetite this week. October is one of the best months of the year for sailfish and the strong east winds really get them hungry. We’ve been catching quite a few sailfish lately by trolling, but our best technique for catching sailfish is by kite fishing. Kite fishing is a technique that uses kites to suspend the baits on the top of the water where the baits have to struggle to keep their heads underwater so they can breath. These struggles put out vibrations that predator fish pick up on and draw them in. The one constant that you need to go kite fishing is sufficient wind. A good strong and steady wind is necessary to keep the kites and baits up. Couple the strong easterly wind (best sailfish conditions) with an ability to go kite fishing and get ready for some great sailfishing! While sailfish and dolphin are the main catches on our deep sea fishing charters, there’s a bevy of other fish biting as well. Kingfish, barracuda, wahoo, blackfin and skipjack tuna are also biting on the reef. These fish are biting best trolling lures around on the reef. You never know what you might catch when you’re trolling. Wrecks are holding fish as well, but with the wind and waves as they are, trolling/kite fishing techniques are more productive. This windy weather may seem like not a good time to fish, but quite the opposite, we wait all year for these conditions. Some of our best catches of our lives happen on the windiest, roughest days. Good luck to everyone fishing over the next week. I’ll sea ya on the water. The snapper and kingfish action has really lit up this week. Our drift fishing boat is catching them very good on the reef in 90-110 ft of water. The kingfish are biting best on the early morning run. We’re catching them on whole ballyhoo and sardines drifting them about mid-depth. Snappers on the other hand are biting best on the afternoon and night anchor trips. They usually bite better later in the day and into the night. We’re catching our snappers either with chunks of squid or other chunk bait (best for yellowtails and mangrove snappers). Plug baits (a whole sardine or ballyhoo with it’s head cut off) work best for mutton snappers and groupers. 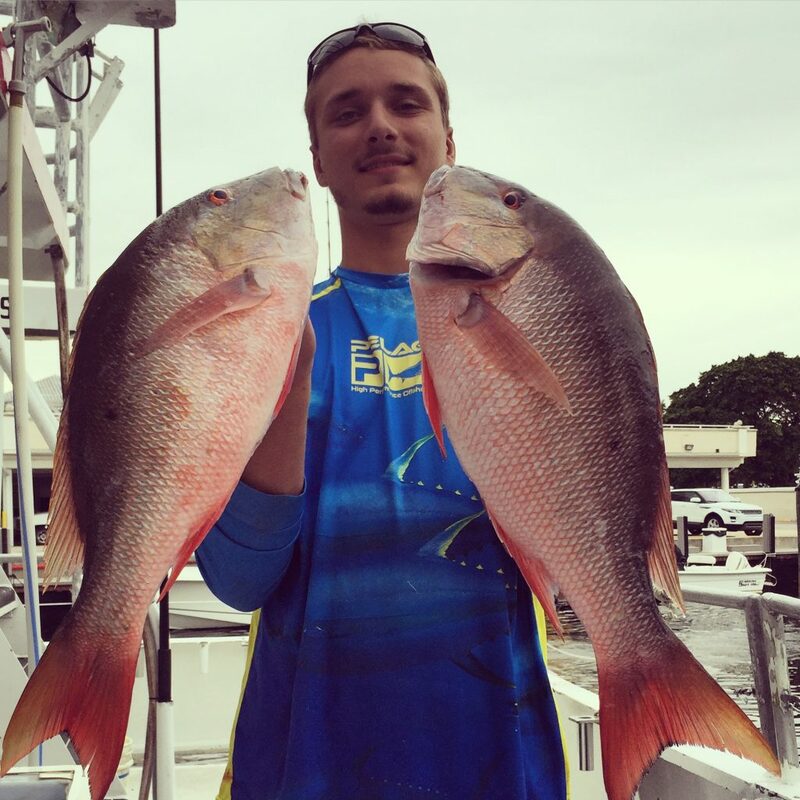 Nice mutton snappers caught on our drift fishing trip. 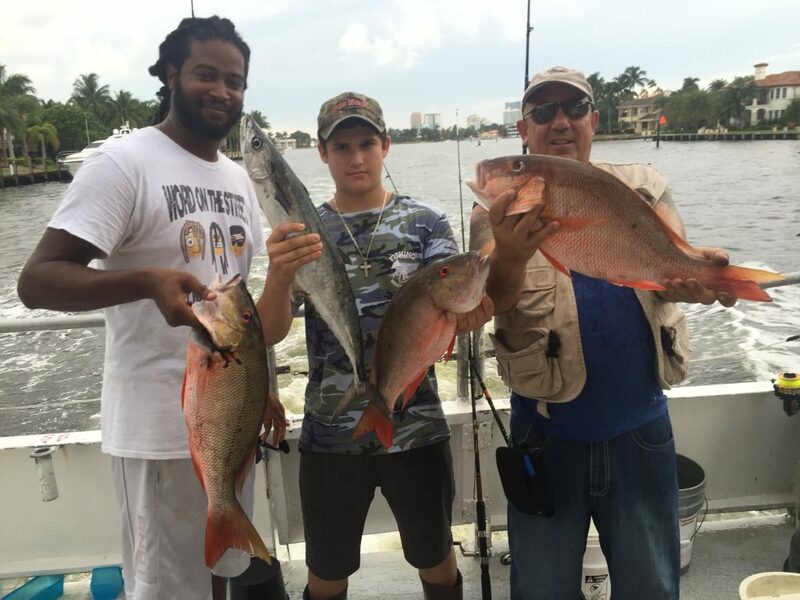 The king tides this month during the few days around the full moon can make for some crazy snapper fishing. This week, we’ve had some outstanding nights for mangroves. Still, the mangroves on some nights can be snapping and on other nights non-existant. On the nights when the mangrove bite is slow, we’ve been falling back to our yellowtail spots and doing well catching yellowtail snappers. On most nights we come home with a few good sized mutton snappers are well. Snappers are the main target on the night trips but we also get a few groupers and sometimes even a really big cobia. We get some sharks on our night trips this time of year as well. At night, you can catch just about anything, you never know what you’re going to get. 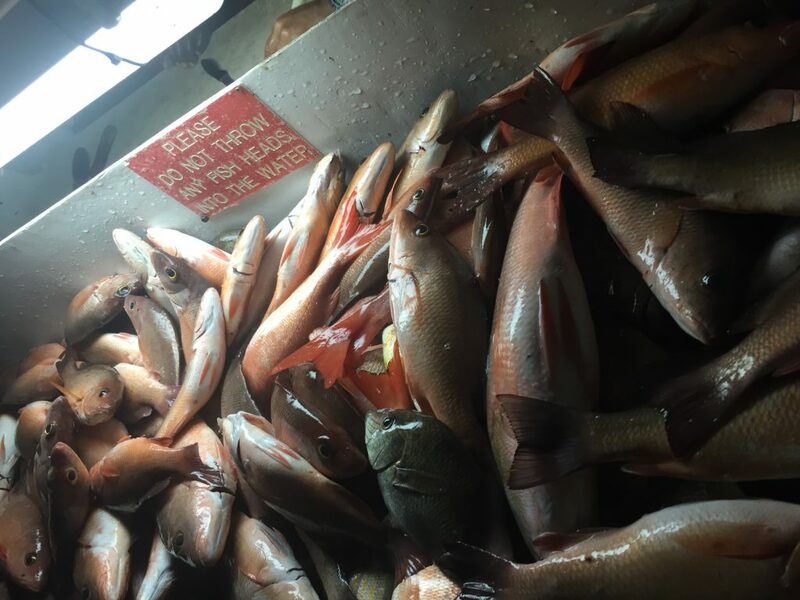 Lots of mangrove snappers are biting on our night anchor trips. The mullet run is in full swing and there’s a mixed bag of all sorts of species trolling the Ft Lauderdale reefs. Kingfish, tunas, sailfish and wahoo are all taking advantage of the easy pickings on mullet. Every year, the mullet make their way down our coastline, filling our inlets and Intracoastal waterway with their schools. They bring a lot of life with them during their migration as larger, predator fish follow close behind to pick off any mullet that lags behind the rest of the school. 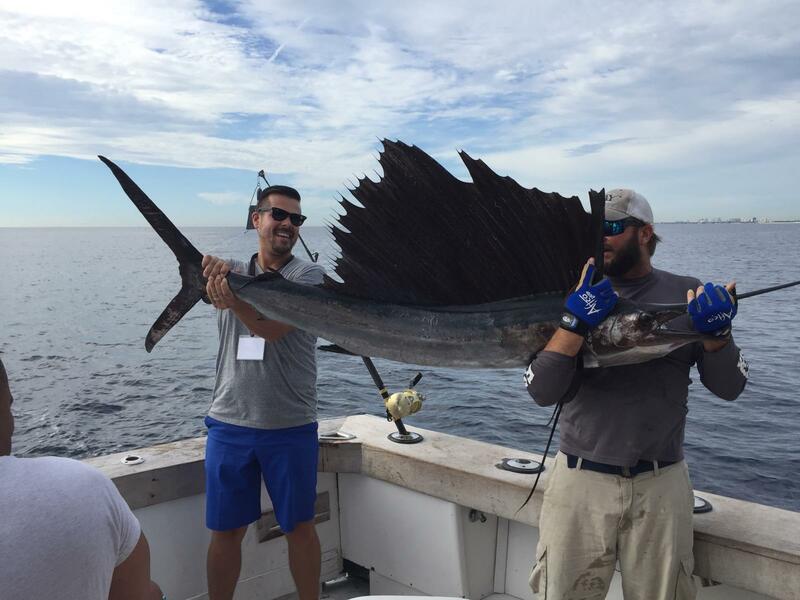 Right now, sailfish are biting really, really good on our sportfishing charters. 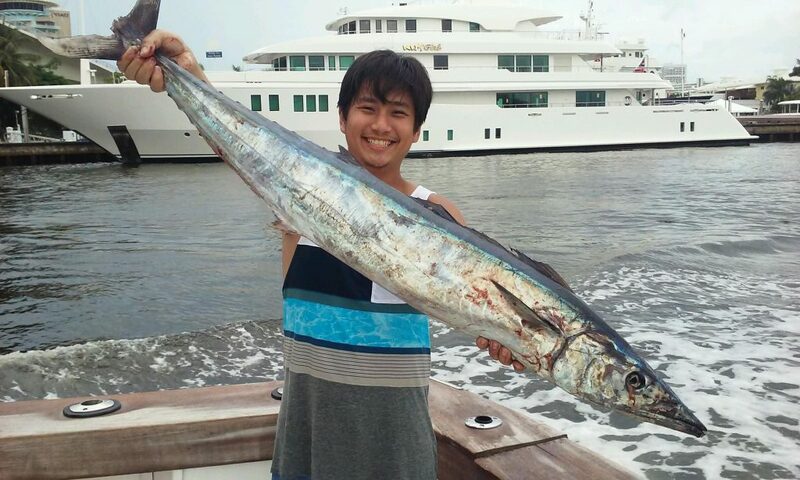 Kingfish, blackfin tuna, wahoo and barracuda are also biting excellent. 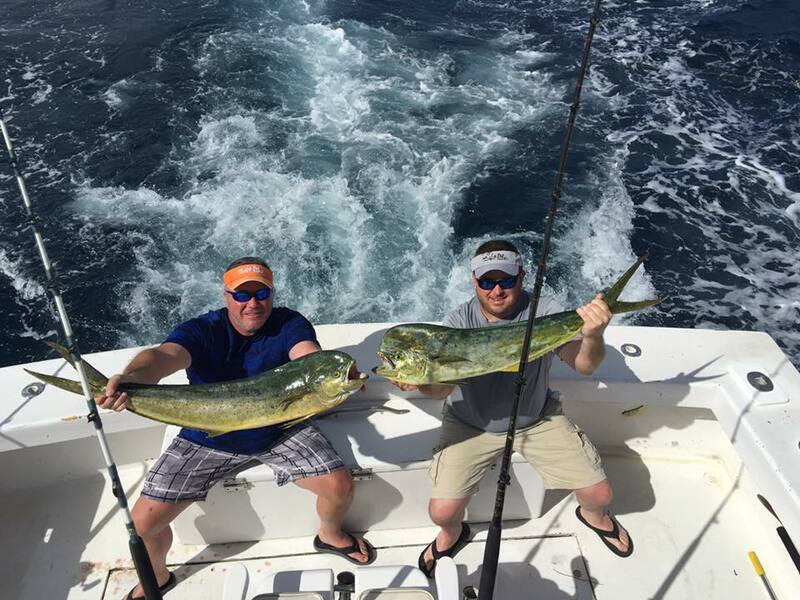 Our sportfishing charters are our best trip for catching the most and the biggest fish. Sailfish season starts now and lasts through February. Sailfish LOVE the windy, cooler weather as it moves through. The windier, cooler the day, the better the sailfish will bite. Nice sailfish just caught in Ft Lauderdale. Mahi-mahi are scattered and spotty. They don’t bite every day. They are around this time of year and this past week, with the hard east wind, it has blown the mahi in closer in to just outside the reef. We’re catching them in 120-350 ft of water. The easterly wind is definitely the reason. Dolphin move with the wind and the hard east wind blows both the sargassum weed in closer to shore, and with it brings also the mahi-mahi. Just remember stong east wind equals both choppy seas and mahi-mahi. 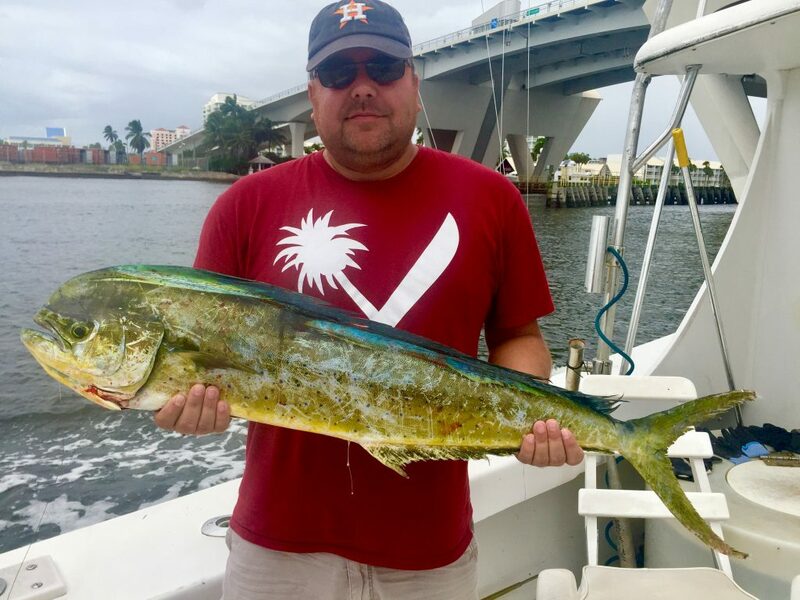 Nice dolphin caught on our sportfishing charter in Ft Lauderdale. Remember with these big tides this time of year, it is also a good time for wahoo. Wahoo love the full moons because they love the big tide changes. With the Ft Lauderdale king tides, also comes the best wahoo fishing of the year. You want to fish the tide change, I like the height of high tide until the trough of low tide. We catch some really big wahoo this time of year, get ready for some big wahoo pics coming next week. Good luck to everyone fishing this week. There is a lot of variety of fish this time of year. If you can brave the seas (and they are choppy this time of year), you have potential to catch some pretty awesome fish. I’ll sea ya on the water!